This excerpt is from The Twig, our donor newsletter. 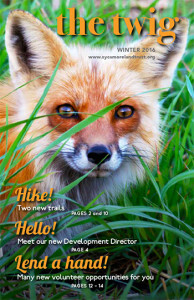 Click the cover to view the full issue. Have you ever seen a glacial erratic? It’s a rock, often boulder-size, that was transported from far north by a glacier and then left behind after the glacier melted away. Also called dropstones, they are not showy, but are notable because they are different from the local bedrock. Want to see one? The new trail at Sycamore’s Laura Hare Nature Preserve at Downey Hill in Brown County has been intentionally routed so that hikers can pass by and observe several of these erratics. 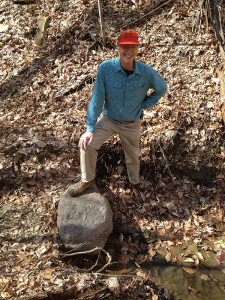 Russell Boulding, retired geologist and Sycamore volunteer, shows off a glacial erratic he discovered while scouting The Laura Hare Nature Preserve at Downey Hill. The erratics here are the southernmost ones he has seen. The new trail at Downey Hill is the work of the Hoosier Hikers Council (HHC) members and volunteers, along with volunteers from Sycamore. Early in 2014, Sycamore Assistant Director John Lawrence discussed with Pete Banta, then HHC president, the possibility of a trail to the north of the small gravel parking lot on Valley Branch Road. HHC took on the project, no small task. Scouting began in April 2014. HHC member and trail planner Jim Shearn says, “It took days and days to route the best way past good stuff, and the route must be sustainable.” That means paying careful attention to drainage patterns to keep the trail walkable. 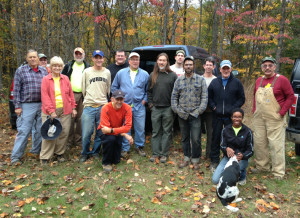 Volunteers with the Hoosier Hikers Council during a fall trail workday at The Laura Hare Nature Preserve at Downey Hill. Photo by John Lawrence. A south loop trail is also being planned that will be more rugged and advanced because of the steep terrain. Ferguson says the trail site has elevations as high as 900 ft. The “good stuff” here will include an old home site with a cistern and root cellars, and a stand of white pines that attracts migratory birds, including state-endangered cerulean warblers, in the spring. And some more glacial erratics. Interested in volunteering? No experience or exceptional strength needed. Learn more here.